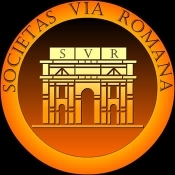 The Societas Via Romana (Roman Way Society) is a multicultural, creative and organic society that celebrates the legacy of the classical world. Enter the forum - the place where we discuss all topics from Antiquity. You can also find our collegia and comitia here. Welcome to the confabulatorium - our chatroom. Check the forum for updates on chat sessions, or drop by to see who's there right now. The Societas Via Romana strives for clarity, simplicity and accessibility in its regulations and inner workings. Here you will find all information about our administration and our internal rules. The Ludi Societatis, our very own virtual form of chariot racing. Here you'll find an overview of our different factions, players, and rules. For questions or feedback about your membership, the SVR as an organisation, or our Web site and Forum, contact our Curatores.